Miscellaneous Moto Pics - Please add some of your own here!! Oink, oink, oink.... It's Baconfest! 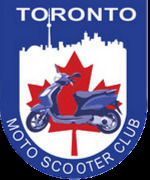 Welcome to The Toronto Moto & Scooter Club (TMSC), this is Toronto's Premier Scooter Club bringing scooterists together from all walks of life. Our club consists of scooterists and motorcyclists of all ages, both sexes, all races and sexual orientation without prejudice. We welcome motorcyclists who are up for riding with scooters. Come ride with us and/or join in on the lively discussion (via Message Boards, under the "More" link on the home page). Celebrate the coolest form of urban transportation. It doesn't matter what moto or scooter you ride whether it's Plastic Fantastic or Italian Stallion, Vintage or Modern, join us and have a great time.